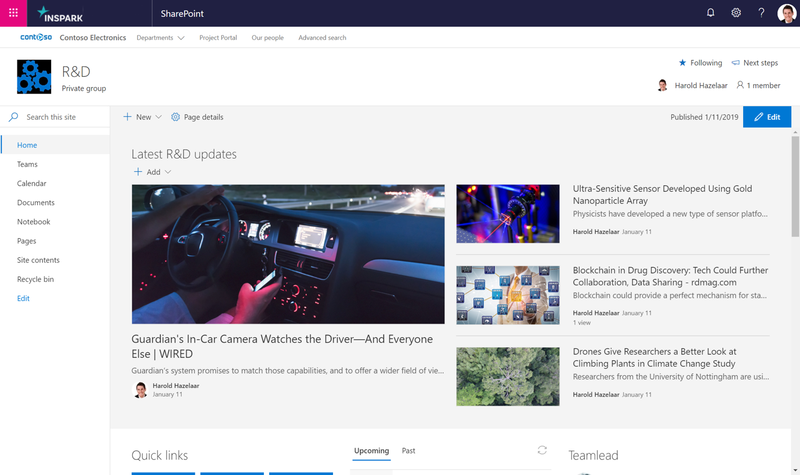 SharePoint team sites have been available with the “modern” UI since late 2016, but many organizations are just starting to modernize their classic environment. Lists and libraries are not only the backbone of any team site, but also the core of content management platforms such as SharePoint. It made a lot of sense that Microsoft’s first move in modernizing the SharePoint experience affected how users interact with these crucial components. Improving the interface of lists and libraries isn’t quite enough to improve collaboration in SharePoint and in Office 365 as a whole set of collaboration tools. That brings us to our next point: SharePoint news. All modern team sites feature an out-of-the-box News section that replaces the newsfeed used in classic SharePoint. The new SharePoint News experience provides a quick and easy way to share important (or just-for-fun) content with your team. Its user-friendly, intuitive UI makes creating and disseminating news posts effortless for everyone—a great enhancement to any team's collaboration efforts. 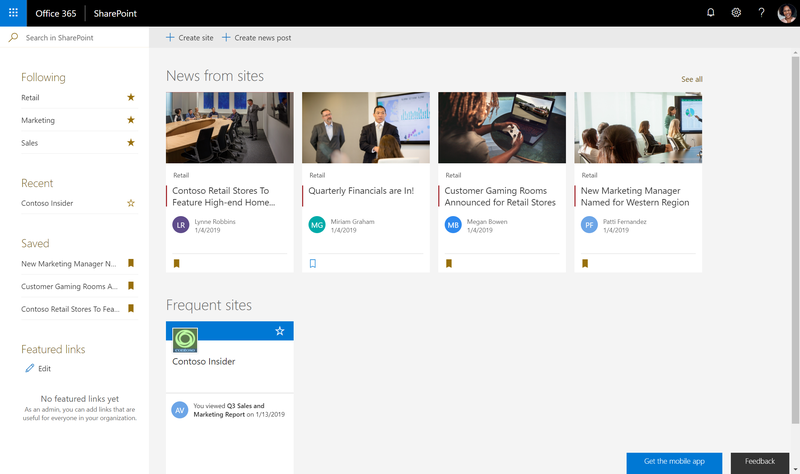 Modern SharePoint team sites are out-of-the-box responsive—which might not seem like a big deal in this day and age, but long-time SharePoint users know just how far we’ve come. Back in the days of SharePoint 2010 and 2013, you had to use a third-party app to get things to work on a cellphone or tablet, and even then, you could only work with lists and libraries, not browse the whole site. Those days are finally over! 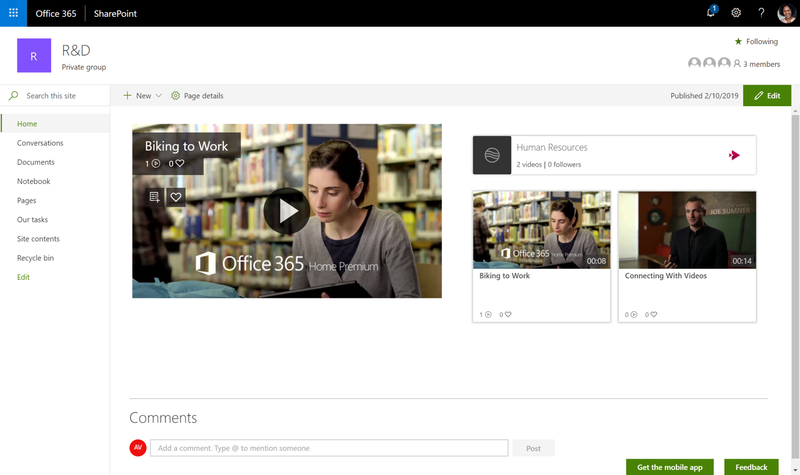 You can access your modern SharePoint team sites on any device via the Microsoft SharePoint app. The app’s interface is clean and allows you to view the entire contents of your team site at a glance—for example, the latest news posts (posted with team news) or the documents your team is working on. Note that although the Microsoft SharePoint app doesn’t support document library views, it does let you easily search and read documents. Office mobile apps—Word, Excel, OneNote, PowerPoint—are seamlessly integrated with the SharePoint app, allowing you to easily edit your documents on the go. Users can now get their work done on their way to work (reading their 9AM meeting pre-requirement document in the bus is definitely practical)! 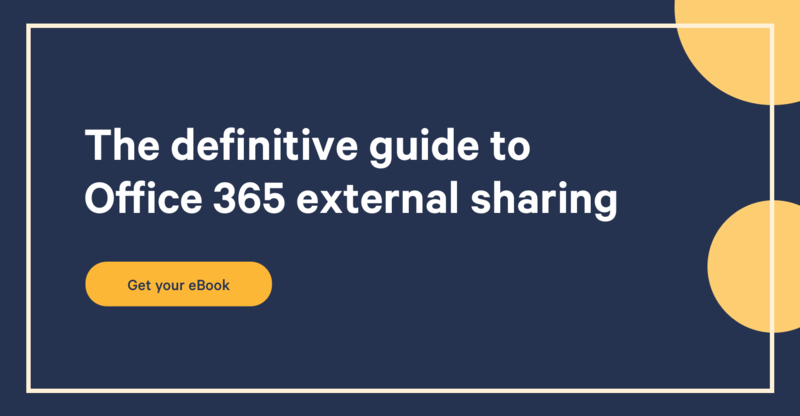 But you can’t make an omelet without breaking a few eggs, as they say, and the release of these user-friendly web parts in SharePoint Online sparked some heated discussions within the SharePoint community. The fact that many classic web parts didn’t (and still don’t) have a 1:1 equivalent in modern SharePoint was one of the more widespread complaints. Similarly, moving from classic to modern meant that a lot of custom in-house solutions, some operations-critical, would simply no longer work. This disappointed more than a few developers, who were left with the option of switching to the SharePoint Framework (SPFx), which involves a significant learning curve. Personally, I miss having web parts for lists, libraries and SharePoint Search, all of which were essential components in classic SharePoint. The main difference between classic and modern team sites is the integration with Office 365 Groups. That was a major game-changer because over the years, classic SharePoint team sites turned into a sort of catch-all platform where users created calendar lists, tasks lists, announcement lists and others, when truly the power of SharePoint team sites is to host content (specifically documents) and potentially share news your team might be interested in. Planner is a kanban board tool similar to Trello. Teams can use it for project management and to align their efforts while working on a series of simultaneous deliverables, for instance. Stream is a corporate video hosting service similar to Wistia. 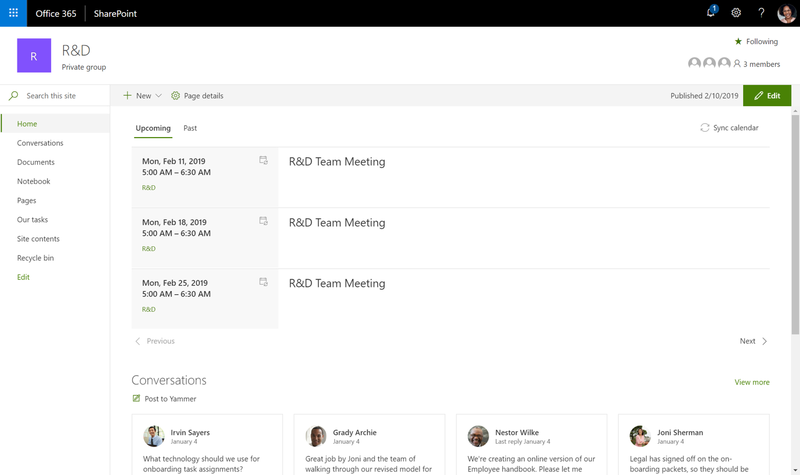 Outlook is to retain email conversations, display your own calendar and view your colleague’s agenda to book meetings. SharePoint calendars never provided the same functionality as an Outlook calendar. 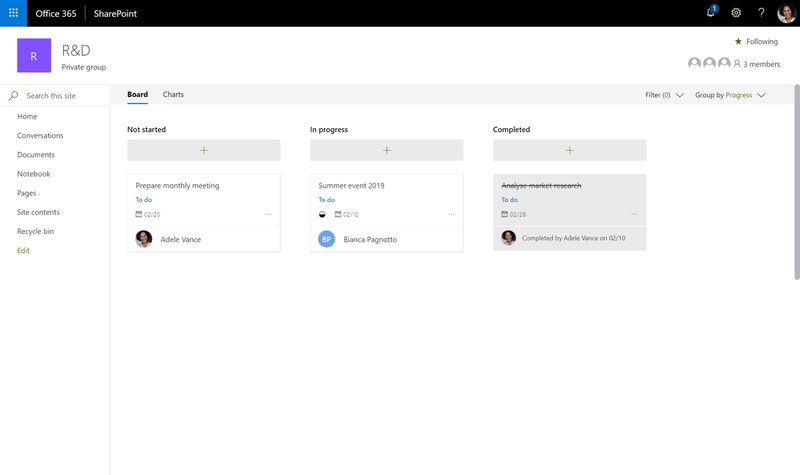 This problem is now resolved with the integration with Office 365 Groups, as modern SharePoint team sites are now connected to an Outlook shared calendar (and a shared inbox, too). The power of Yammer is to display a feed of conversations where users can interact with one another. Microsoft calls it an "enterprise social network". OneNote provides a quick, flexible way to take virtual notes and organize them in a virtual notebook that makes sense for the users and the way they organize their work together—because sometimes creating a Word document is just overkill. An example of a OneNote equivalent would be Evernote. Modern SharePoint team sites were met with criticism when they first launched, but that was to be expected: Microsoft hadn’t really updated the SharePoint experience in years, so it was a lot to take in for long-time users. Our favorite web parts, such as the search and content editor web parts, are still today nowhere to be found and custom solutions aren’t possible anymore. We will miss those days. But once Microsoft started releasing new features and refined their vision for modern SharePoint team sites, things turned around. 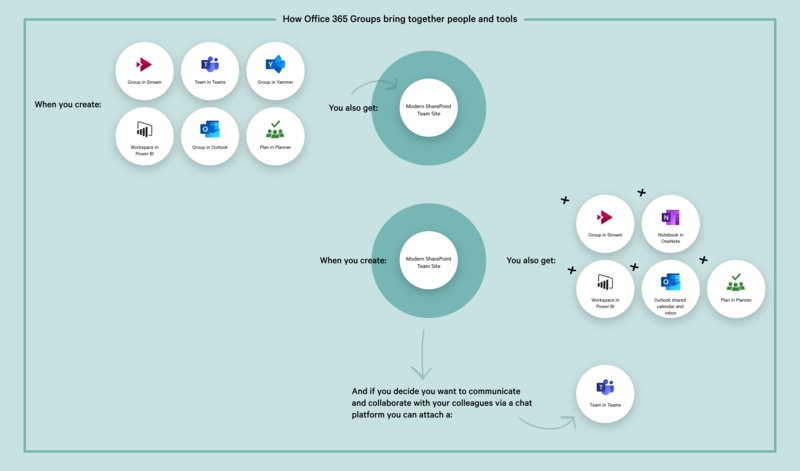 The integration with Office 365 Groups morphed the modern team site into a collaboration powerhouse. That’s because SharePoint has a clear focus: content and document management. Other features, such as calendars and task management, are fulfilled by other Office 365 services—as they should be.